I'm surprised the driver spotted somebody getting on the rear door of an LT and not touching in, it would be impossible at busy times. I got on a 468 recently, two people walked straight past the driver who called out to them but they didn't hear him, or pretended not to, and went upstairs. No further action was taken, most fare dodgers at least go through the motions of trying to use an invalid oyster. I don't get these stories about LTs either. It is not the driver's job on LTs to monitor who taps in and out. The bus is not designed for him/her to monitor and so any driver holding a LT up has got a problem and is the one causing the problem to passengers. TfL created this issue when it comes to LTs and they should suffer the consequences in lost revenue. Indeed, the only time I've seen a LT driver do anything about possible fare evasion was on a 211 that I boarded at Waterloo and all he did was cause problems. Actually it might have been the same driver mentioned earlier in the the thread on the 159, both routes are from QB. He managed to close the middle doors on a boarding passenger who was understandably not very impressed, when he complained the driver said quite incredibly that it was his fault for trying to board through the rear doors and he was fed up with people doing that to get a free ride. The passenger showed he had his oyster in his hand ready to touch in and a lengthy argument ensued. Such was the delay that before reaching Victoria the 211 behind had caught up and several people including myself got off and got on that, one passenger told the driver of the problems on the other bus and he just shook his head saying "the guy is a nutcase" and urged passengers to put in a complaint. As you rightly say open boarding is not designed for drivers to check boarding passengers. I was told that LT drivers are not responsible (and therefore won't get booked) for any fare evasion on those buses. I'm presuming it's the same with the 507 and 521. Does anyone know when the LT boarding changes are set to happen? I thought I read somewhere that LT's will slowly be converted to front entry and rear exit only starting soon? They are. I was just asking if anyone knew any further details on when this will be implemented. Yes I've seen them there in recent days as well. Which route(s) did this occur on? TT drivers certainly don’t do that!!! I witnessed the exact opposite Tuesday. 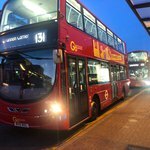 Was about 7:30pm, a ton of people were piling onto an Ilford 425 and as the last person got on the driver closed the door, turned the engine and the lights off, went upstairs to the back of the bus and got the guy to come downstairs and tap his Oyster TT drivers are so sassy I love it, it’s not the first time I’ve seen that from TT drivers either. I'm somewhat aghast that a driver would leave the cab and go upstairs after a fare dodger rather than use the PA system, if they end up getting assaulted they'll probably be told that they bought it on themselves by leaving the cab. In the days before buses had decent PA systems it wasn't unusual for some drivers (well the bigger ones) to get out of the cab to have a go at fare-dodgers / smokers etc. Of course operators are now much more scared of litigation so drivers are generally forbidden from leaving the cab, but that's a relatively recent development. At least the PA does give drivers scope for using their imagination. Like the one who called out a fare-dodger with "Oi you! Yes you in the cheap M&S suit! I know you ain't got money for a proper suit but you still need to pay your fare". I think announcements like that will be frowned upon if anybody in authority gets wind of it. One of the problems I always had when challenging someone with an out of date pass, was the rest of the passengers would start yelling: "hurry up driver, i've got to ............."